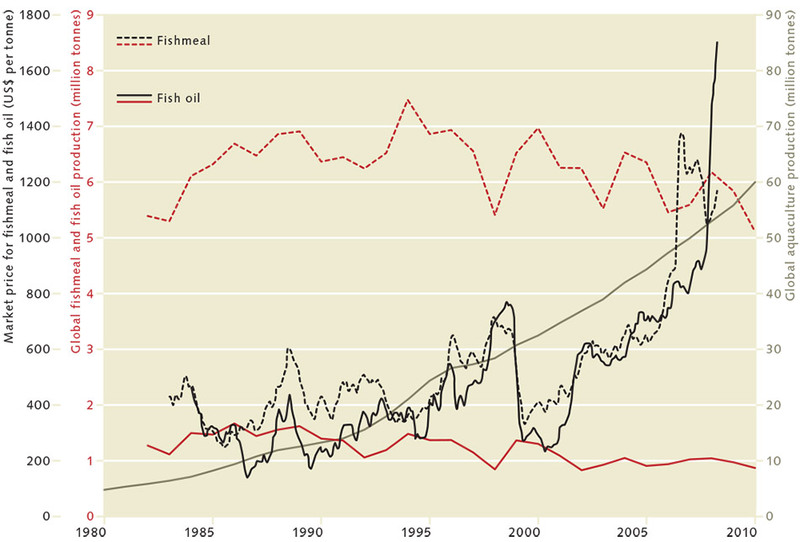 4.8 > Today fishmeal and fish oil are predominantly used in aquaculture. They are extracted mainly from anchovies and sardines. What do farmed fish eat? The impact of aquaculture on the environment depends on several factors. It makes a difference whether the fish are farmed inland in freshwater, or along coastal areas. Intensive fish farms in coastal waters can pollute entire bays with uneaten food and fish faeces. Large areas of land are sacrificed to set up ponds, for example. An accumulation of effluent from aquaculture facilities can cause over-fertilization if it contains excess nutrients. Moreover it can contain residues of veterinary drugs. Feed is another important factor to consider when carrying out an environmental audit for an aquaculture operation. First of all, it is crucial to ascertain if any feeding at all is required, and if so, what kind of feed should be given to the aquatic animals. The aquaculture industry differentiates between natural feed and artificial feed. Natural feed includes the organisms that fish find and exploit in their surroundings. For example, mussels extract nutrients from the water without needing extra food. Carp feed on mosquito larvae, small mussels and zooplankton. Artificial feed (mostly in pelletized form) is processed in factories by feed manufacturers. The pellets are made of grain, fishmeal and fish oil. They contain all the nutrients which the species of farmed fish requires, and also a high proportion of protein and fat. Pellets are used for intensive fish farming – by companies which breed and sell fish on a grand scale. Salmon, tilapia, sea bass and some shrimps and lobster are fed with diets that contain fishmeal and fish oil from marine origin. Small aquaculture operators in particular tend to use feed which either grows or can be sourced locally at affordable prices. This includes plants, crop residues and fish waste. The most controversial types of feed are those which contain a high proportion of fish. The problem is that the farming of some species requires the use of wild fish as feed – in most cases small pelagic fish, particularly anchovies, sardines and herring. 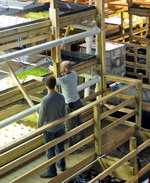 Salmonid farming utilizes relatively large amounts of fish-based feed. Fishmeal and fish oil are produced in large industrial facilities, which involves grinding and boiling the whole fish. Centrifuges are then used to separate, dewater and dry the resultant mass. In light of the fact that many wild fish stocks have been reduced to critical levels, it seems nonsensical to use them as fish feed, especially if the volume of wild fish produces a lower weight of farmed fish, as expressed by the “Fish In – Fish Out” (FIFO) ratio. For this reason critics are urging people to eat the wild fish directly, instead of using it as feed. 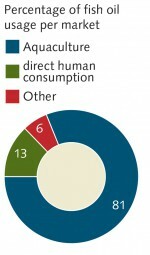 However, so far there has been limited demand around the world for small pelagic fish as food. Markets would first need to be developed. The fishmeal industry points out that the use of fishmeal and fish oil is justified because the fish utilized are from stocks that are in good state as a result of good fisheries management. But it is fair to say that not all these fish stocks are in fact managed sustainably. Not only salmon and eels, but many other farmed aquatic animals are currently being fed with fish caught in the wild – particularly with pellets processed from fishmeal and fish oil. 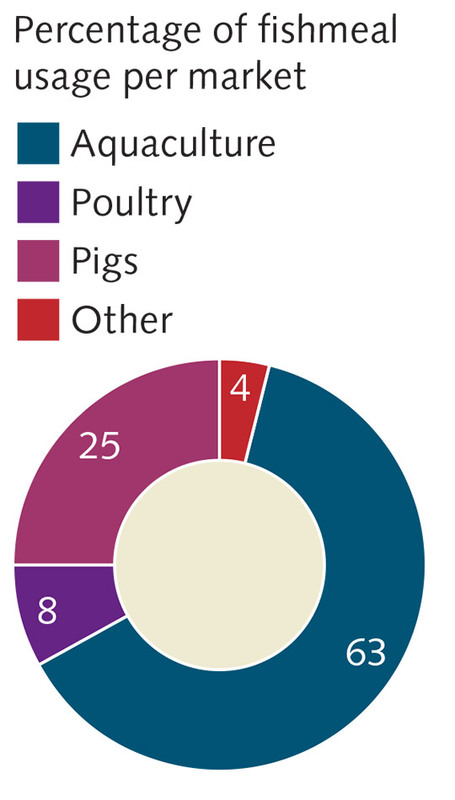 Fishmeal and fish oil have been used in the farming of both poultry and pigs for decades. However, rising prices have reduced the proportion of these commodities in their feed. Aquaculture is by far the largest consumer, accounting for about 60 per cent of fishmeal and 81 per cent of fish oil. Fish oil is mainly used in the breeding of salmonids. Norway has greatly expanded its salmon farming facilities and is now the largest importer of fish oil. 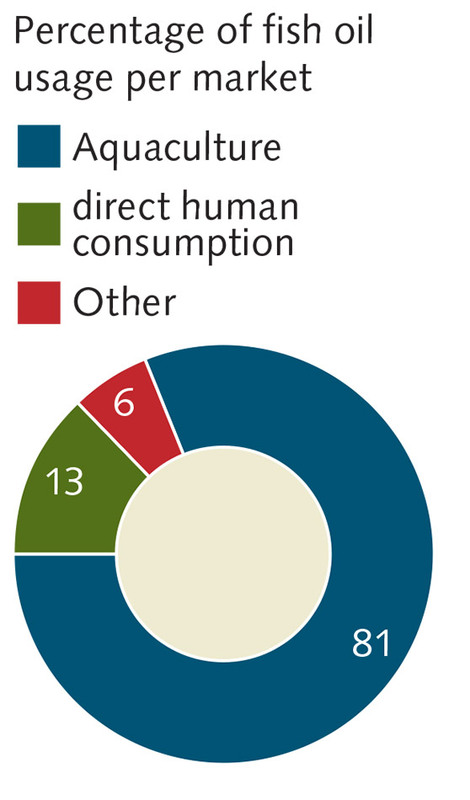 The amount consumed in food supplements and medicinal products for human use is 13 per cent. Fishmeal and fish oil are extracted mainly from anchovies and sardines, which are found in large numbers off South America. 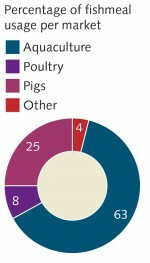 China, Morocco, Norway, Japan and other nations also produce these commodities for their own consumption and for export. Among others, blue whiting, sand eels, capelin and sundry waste from fish processing are used in these countries. While Norway imports the most fish oil, China, Japan and Taiwan are the largest importers of fishmeal. Yet despite the strong growth in aquaculture of recent decades, the production of fishmeal and fish oil today is almost the same as it was in the early 1970s. There are several reasons for such growth combined with virtually constant inputs. First, the price for fishmeal has increased considerably in recent years as a result of strong demand in the importing countries, especially China. For this reason aquaculture producers are more interested in using feed substitutes – from crops for instance. Second, the FIFO ratio of many fish species has been reduced by the use of improved feeds or improved feeding regimes. 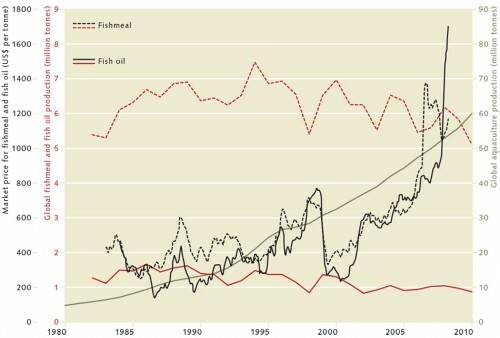 4.9 > Although the output of aquaculture has increased greatly over the past 30 years, the sector’s consumption of fishmeal and fish oil is at about the same level as in the 1980s. Greater use of plant-based nutrients is one reason; more efficient utilization of fishmeal and fish oils is another. The price of fishmeal and fish oils has multiplied, mainly due to rising demand in China. Extra Info How much fish does a fish need? Rapeseed in place of fishmeal? Scientists are working hard to reduce both the amount of additional feed used in aquaculture and in particular the FIFO ratio. One approach is to develop crop-based feedstuffs which are rich in protein. The problem is that fishmeal contains a high percentage of protein, about 60 per cent, which is essential to build muscle mass. Rapeseed (canola), however, contains only 20 to 25 per cent. For this reason the researchers are trying to produce protein extracts, varying the amount of different proteins to ensure the feed is very easily digested and converted to body mass. Rapeseed is showing particular promise. This crop is utilized extensively for bioethanol (biodiesel) production: the large amounts of plant waste which accumulate would be suitable feedstock for aquaculture. Protein can also be extracted from potatoes. Trials have been carried out using various different combinations of potato protein. Up to 50 per cent of fishmeal could be saved without any negative impact on the growth of the farmed fish. Alternative feedstuffs can also achieve the opposite result, however. So-called anti-nutrients can have a disastrous effect. These are substances which are poorly utilized by the fish and can induce metabolic disorders. Scientists are convinced that feeding farmed fish with a combination of different ingredients is the most efficient approach. This would further reduce the use of expensive fishmeal and lower the FIFO ratio. It would make little sense to dispense with fishmeal and fish oil completely, however. Both provide essential omega-3 fatty acids which come from plankton. Fish cannot produce these themselves but ingest them with their food. If they are fed only plant-based feedstuffs, the farmed fish will lack these essential fatty acids, thus defeating the object. Such omega-3 fatty acids are one of the main reasons that consumers choose to eat fish. the further development of high quality proteins and fats from plants and microorganisms.